So, here is a nice story. 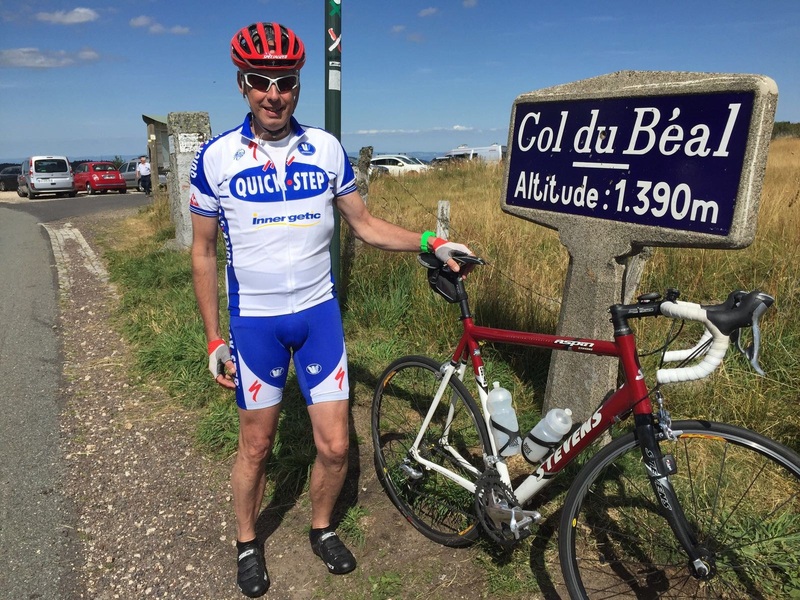 Thirty odd years ago, when The Wattmeister was 10 kgs heavier than he is now, his mate Guido was training for the 264 kms Liege-Bastogne-Liege cyclosportive, which, on the homeward leg, takes in brutally steep hills of the Belgian Ardennes. Being a Dutchman, Guido’s hill training was comprised mainly of rides of 100 kms solo into a bitterly cold headwind. The younger Wattmeister listened to Guido’s training schedule in awe. Now, let us progress through time to 2017. Guido has worked harder and exercised less than in his youth, he suffers a heart attack. This scary threat to his health at the age of 59 precipitates a change of lifestyle and consequently his love of cycling is re-ignited. 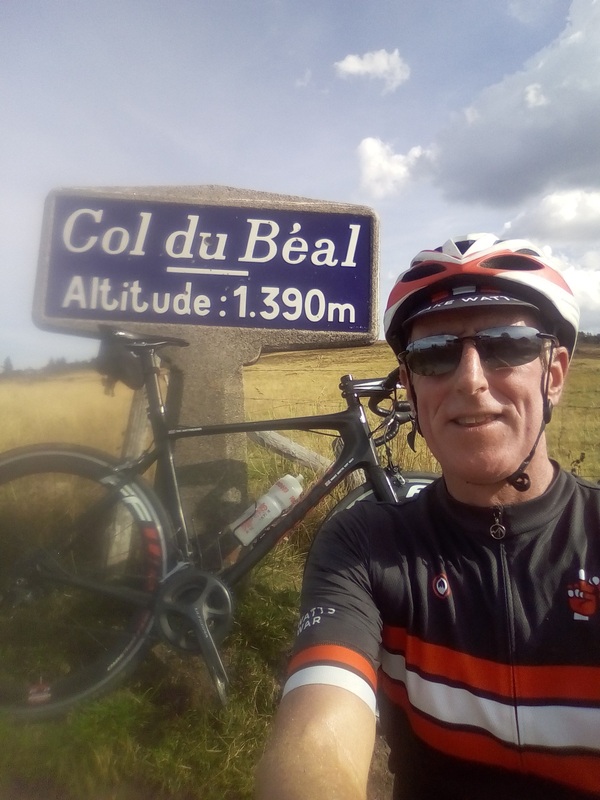 In August 2018 on his 60th birthday, Guido sends a Whatsapp photo of himself at the summit of the Col du Béal, having ridden up from Vertolaye in the north east of the volcanic Massif Central. Inspirational! Suitably impressed, The Wattmeister vows to send Guido a photograph of himself the following month on HIS 60th birthday. A satisfactory trundle through France saw The Wattmobile parked up in the village of Olliergues caressed on one side by the La Dore river and hugged on the other side by the D906 from Thiers to the north. Initially, there is a short, stiff pull up through the village on the D37, which has an excellent road surface. After a series of twists and turns which last about 3 kms, the Route de Brugeron straightens itself out for a bit, still super smooth under wheel, passing the left turn to Olmet and Augerolles (lovely detour) and climbs gently to the village of La Brugeron. Here, after about 10 kms at an average gradient of approximately 3.5%, one’s legs are nicely warmed up, and one’s eyes have feasted on a beautiful landscape…..and furthermore, by this point, on 20th September 2018….The Wattmeister had only seen one single car. The climb proper starts in the village with a little dig up into the trees via an alpinesque hairpin bend. The gradient averages about 6 % for 11 kms, with a maximum figure of 9%. The views are intermittent, but the tranquility and sense of solitude are constant. Still only one car in an hour or so of cycling. About 2 kms from the summit, the road exits the forest and continues to climb up onto a rocky moorland, not unlike the Peak District with its craggy tors……except that there is a ski station to the east of the Col. Exposed to the elements, the last 1500m felt like quite a slog, but views of the southern French Jura to the east, and the volcanic ridge incorporating Puy de Dome to the west make the effort worthwhile. There are several routes to the summit, but a rapid descent to down the D40 to La Bourlhonne and a diversion via the Col du Chansert…..on an even quieter road…..is highly recommended, as is a lunch visit to La Cherlen Café in Augerolles…..although The Wattmeister cannot show his face there again after abusing the cheeseboard. Well done, Phil! And happy birthday!! There we go young man. Good prose and goos work! And what of the Maderia Cake? Hopefully not with Valarie?